The minute you walk into the oral care aisle, you’re slammed with mouthwash options. Not only are there so many brands to choose from, but so many types of mouthwash that accomplish different tasks. You have one that touts it bad-breath fighting abilities while others emphasizing their “alcohol-free” qualities. Just like many other products, these mouthwashes are only over-the-counter, which means there are prescription washes worth considering as well. So, how does one sift through all the different types of mouthwash? According to your dentist, the key is to find a mouthwash that caters specifically to your needs. Today, he’ll explain what you should look for and how often to use your mouthwash. When you think of mouthwash, the first thoughts that come to mind are probably burning sensations and fresher breath, right? It’s important to note that not all mouthwashes need to be painful to use, nor do all of them exclusively provide fresher breath. Some work harder to fight dental disease while others only focus on catering to people with bad breath. This means that picking any mouthwash off the shelf won’t guarantee a solution to your dental problem. Before purchasing, take a few moments to read the label on the mouthwash so you can learn about its active ingredients. Check if it’s ADA-approved to kill oral bacteria and prevent common diseases like gingivitis. General Cavity Protection – If your dentist tells you that you’re vulnerable to cavities or wish you had another level of defense, purchase a fluoride-based mouthwash. Fluoride is the same active ingredient in toothpaste that works to reduce cavities and gum disease. Fighting Gum Disease – While fluoride already works to reduce gum disease, look for mouthwash that contains essential oils as well. This helps soothe the gums and kill bacteria that’s known for causing gum disease. Freshening Breath – While most mouthwash claims to freshen breath, you’ll need to use a mouthwash that contains an antibacterial like alcohol to kill bacteria that causes bad breath. This temporarily cures the condition, while other mouthwashes simply mask it. If you choose an alcohol-free mouthwash, you’ll need to keep this mind. Whitening Teeth – Like toothpaste, certain mouthwashes contain abrasives that work to remove surface stains and brighten your teeth. They may contain baking soda or other active ingredients typically found in whitening toothpaste. 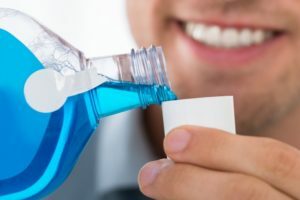 Periodontal Disease – Prescription mouthwashes containing ingredients like chlorhexidine are intended for treating more significant gum disease and can only be obtained via a prescription from your dentist. Ask your dentist if you think you might need it for your condition. When using mouthwash, make sure to incorporate it into your daily oral care routine. However, this may vary depending on the type of mouthwash you choose. When in doubt, check the label or ask your dentist for additional advice at your next appointment! Dr. Robert Long earned his Doctor of Dental Surgery degree from The University of Health Science Center at San Antonio. Since then, he completed a two-year general practice residency and became certified to practice additional dental techniques. He’s also a member of several dental organizations and associations that help him continue his education. To learn more tips on choosing the right mouthwash or learn about the practice, contact him at either of his practices via his website.